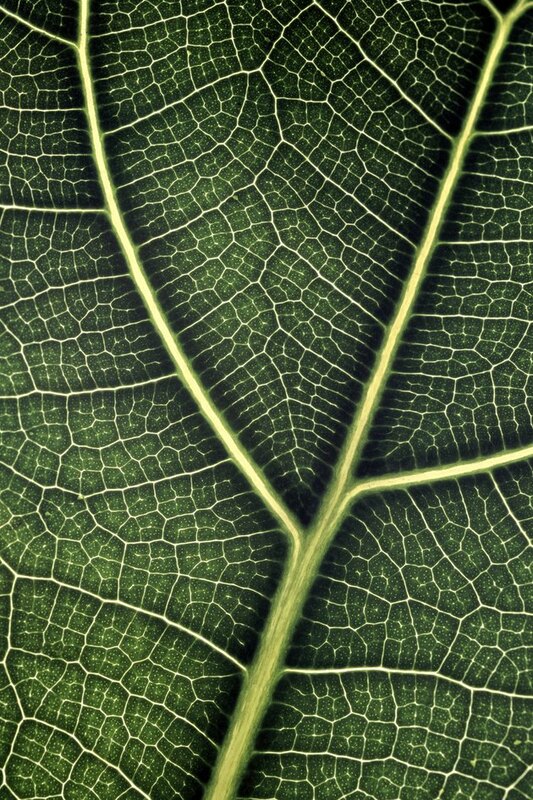 The large, fiddle-shaped leaves of a fiddle-leaf fig (Ficus lyrata) evoke this Ficus genus member's origin in tropical Africa. Also known as banjo fig, the plant is hardy in U.S. Department of Agriculture plant hardiness zones 10 through 12. Although it can grow all year outdoors in Florida, it is generally grown as a houseplant in the United States. The tropical tree grows up to 100 feet tall under ideal outdoor conditions, but indoors it is maintained at 2 to 10 feet tall. Like most Ficus species, it's relatively simple to care for but fussy about its light and water requirements. Fiddle-leaf fig leaves may grow up to 18 inches long. Place the fiddle-leaf fig in a brightly lit location. Although an outdoor specimen tolerates full sun, an indoor one thrives in bright, filtered light near a window. Avoid placing the tree in a drafty area or near an air-conditioning duct. Water a potted fiddle-leaf fig when its soil is dry to a depth of 2 to 3 inches but before the soil is so dry that it pulls away from the plant container's edges. Add water until it runs out of the container's bottom and the root ball is completely soaked. Allow the soil to dry before watering it again. Reduce watering slightly when the tree is not actively growing, in fall and winter. An outdoor fiddle-leaf fig requires 10 gallons of water for every inch of the trunk's diameter about once each week during the dry season. Stop watering during the rainy season, and resume the watering routine when the weather is dry for one to two weeks. Fertilize an actively growing potted fiddle-leaf fig with a one-half-strength 24-8-16 liquid fertilizer solution every three to four weeks. Add 1/4 to 1/2 teaspoon of the fertilizer to 1 gallon of water, and mix the resulting solution thoroughly before using it to water the plant's soil until excess solution drains from the plant container's bottom. When the tree's growth slows in winter, stop fertilizing it until it begins to produce new leaves. Fertilize an outdoor fiddle-leaf fig with a slow-release, 10-10-10 or 14-14-14 granular fertilizer. Distribute the fertilizer evenly around the tree out to its drip line, which is below the tips of its outermost branches. Scratch 3 tablespoons of of the fertilizer 2 to 3 inches into the soil for every 2 feet of branch spread. Water the soil thoroughly after applying the fertilizer. Repeat the application every one to two months in 90 degree Fahrenheit weather or every three to four months if temperatures drop to 70 F. Stop fertilizing if temperatures drop below 60 F.
Raise the humidity around a potted fiddle-leaf fig by using a warm-steam humidifier nearby. Avoid misting the leaves unless you also gently wipe them to remove dust. Misting with a spray bottle is not an effective method to raise humidity in a room. Prune to shape the plant and reduce its size while wearing a long-sleeved shirt, long pants, gloves and safety glasses. Cut back to just above a leaf node on each branch or stem to be trimmed, using anvil pruners. Leaf nodes are where the leaves connect to the branches. Mature branches may drop the leaves, but small bumps remain and new leaves will grow from those nodes after you prune the branch. Disinfect the pruners between cuts with a solution containing equal amounts of rubbing alcohol and water. Monitor the fiddle-leaf fig for pests such as aphids, scales and whiteflies. Soft-bodied groups of green, yellow or other colored insects on tender new growth are usually aphids. Scales look like little brown or reddish bumps on branches and leaves while whiteflies are white and found on the bottom of leaves. Most pests are easily washed off outside by blasting them with water. Scales may be treated by dabbing the pests with a cotton swab moistened with rubbing alcohol. Avoid getting rubbing alcohol on the bark, stems or leaves. Rinse the plant with water to remove the rubbing alcohol.